Head north from Chiang Rai for about an hour and located on a lush green mountain in the kingdom’s northernmost province sits Wat Maa Tong, also known as ‘Golden Horse monastery’. This region is also known as the Golden Triangle — an area comprising parts of northern Thailand and neighboring Myanmar and Laos. The Golden Horse shrine is reputed to date back to the time of the Lord Buddha, where legend has it that he left a sacred footprint there. Locals also talk about a fighting monk (called “The Tiger Monk”) who lives in the Monastery of the Golden Horse. The Tiger Monk gave up a successful boxing career some 16 years ago to enter the monkhood and train young orphans in boxing and horseback riding. 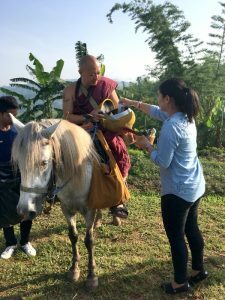 It is now a thriving monastery and every morning a convoy of orange-robed Buddhist monks and novices riding on horseback leave their mountain-top temple in the kingdom’s notorious Golden Triangle region to collect alms. At first glance these equestrian ascetics look like a throwback to a forgotten era — but they are in fact part of an innovative drive to help young boys escape drug addiction in an area that has seen an increase in methamphetamine use. Caring for the horses and training in Thai boxing helps the children stay engaged in a way that traditional classroom learning alone might not. At the temple children also study the basics of agriculture, helping cultivate and manage several hectares of land that feeds the residents of the monastery. Learn more about life in the north of Thailand and how the monks here have created a more positive future for many children in the region. Travelling in the north of Thailand is not only an opportunity to absorb the beauty of its architectural wonders and natural setting, but also a chance to immerse in a distinctive cultural heritage and spiritual progression within the Thai Buddhist framework. During our ‘talk with a monk’ program, guests visit Wat Suan Dok, built by the sixth Lanna king in the 14th century. After a guided tour of the temple guests can take some time out to chat with monks from the area. This is an initiative by the temple in order for monks to talk with foreigners and provide more insight into their religion. It’s an open forum and an excellent way to find more about Thai Buddhist religion, culture and traditions. These ‘monk chats’ are informal discussions where guests sit at a round table and talk with prep-school age monks who are usually accompanied by their teacher. They not only help visitors engage with a different culture, but also play an important role in helping young monks improve their English speaking skills. Buddhism became the official religion in Chiang Mai when it was introduced in the late-1300s. Buddhism is followed by 95% of the population in Thailand with most young boys becoming a novice monk for a short period around the age of 12. Boys from rural communities tend to stay in the monkhood longer as it is a great way to get a better education and learn English. Suan Dok Temple (Flower Garden Temple) is in the west of old Chiang Mai, just off the airport road. There are dozens of small white chedi, ranging from three meters (10 feet) to six meters (20 feet) in height creating a stunning landscape and deeply spiritual setting. This monastery is named after the wild roses that were in bloom when it was built in 1419 to serve as a training college for monks. It continues to do so to this day, and currently houses around 500 monks in residence. 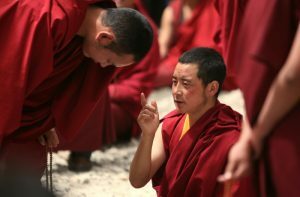 The monastery is one of the best places in Tibet to witness the “Monk Debates,” a lively affair in which monks gather to discuss the teachings of the Buddha and debate Buddhist doctrines. They are quite animated during these debates, using expressive and lively hand gestures and body language to get their points across. Please note that the Monk Debates begin at 15:00 sharp, Mondays through Fridays.